In the years leading up to Charles Darwin's famous voyage on the Beagle, the ship and its captain Robert Fitzroy (1805-65) had participated in a challenging survey of the desolate southern coastline of South America. This three-volume work, published in 1839, describes both voyages. The first two volumes were compiled by Fitzroy. Volume 1 is based on records of the first expedition from the journals of Phillip Parker King (1791-1856), its commander, and other officers. 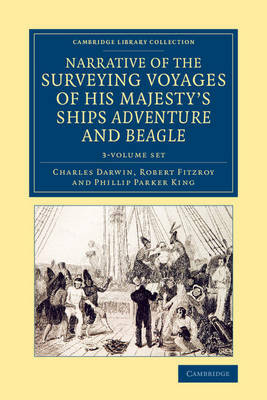 Volume 2 contains Fitzroy's account of the period between the voyages, the recruitment of Darwin as naturalist, and the second expedition to South America, followed by the Beagle's circumnavigation of the globe. It provides important contextual information for Volume 3, which was the first published version of Darwin's journal of the 1832-6 voyage. Darwin's 1845 edition, published for a wider readership by John Murray, is also reissued in the Cambridge Library Collection.